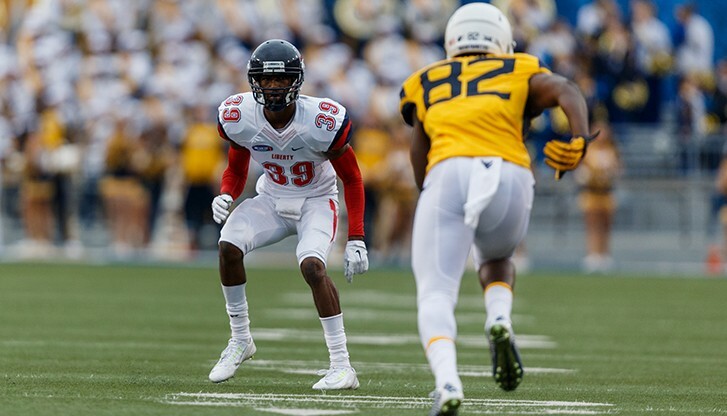 Former Liberty defensive back Chris Turner recently sat down with NFL Draft Diamonds owner Damond Talbot to talk about his path to the draft. My home town is Columbia, South Carolina. It’s like most cities – it has its good areas and bad areas. I love Columbia because of the family and friends I have there and because of the lessons it taught me growing up. Practice is most important because it where you develop good habits and get in “football shape.” It is also where you build team chemistry. Film Study is next because I feel like it is critical to understand not just what your assignment is, you must also understand why you have that assignment and how your assignment fits into the overall scheme. The film also allows you to learn about your opponent and monitor your own performance. Strength and Conditioning – While being strong and in shape is very important, you don’t have to be a bodybuilder to be a good football player. My daughter because I want to provide for her. Getting removed from Liberty University for a stupid mistake I made. I was heartbroken and let a lot of people down, but I never gave up on my goals and dreams. I pushed forward and was able to play my senior season and also graduate. My family member because I would be acting on instinct. Thor because he has his family and friends’ back no matter what. My biggest adversity was getting removed from Liberty University. I overcame the situation by learning from my mistake, working harder and staying positive. My pick-6 against Baylor in 2017 (we went on to win the game). Richard Night Train Lane because he is the all-time intercepting leader and I would want to get tips from him. Respected because it is more important that people respect you as a person for the decisions you make and why you made them, as well as the way you conduct yourself. I would have to say, Josh Gordon. I don’t know the details of his situation, but addiction can be a disease for some people. I have to mention two: The first would be my coach from High School, Coach “E.” He always pushed me to be the best I could be and never gave up on me like a lot of people did. The second is my Dad. He is always there for me, always supports me and always believes in me no matter what.